Following the clash between the police and the Movement for the Actualisation of the Sovereign States of Biafra a few days ago, the Imo State Police Command has arrested of 68 members of MASSOB involved with the showdown with the police. Briefing newsmen in Owerri, the state capital on Monday, the state Commissioner of Police, Austin Evbakavbokun confirmed that 68 members of the Igbo pressure group, were arrested, 62 he said have already been charged to court for alleged conspiracy, breach of peace of the state and unlawfully belonging to society. The CP noted that the suspects were arrested for storming the state with insignias, which were not of Nigeria and above all, conducting themselves in a disorderly manner without a permit from the state police. He also added that the members were chanting war songs, barricaded the roads, thereby obstructing free flow of traffic before his men moved in to disperse them. Evbakavbokun, who frowned on the continual struggle of the MASSOB members, noted that those who had persisted in the struggle never knew how the Biafra war was fought and won, adding that no nation would want to go through that experience again. 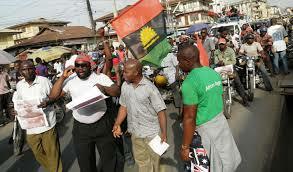 “Those who came out that day, I am sure, never knew how the Biafra war was fought and won. We have one nation. How can two flags be in one nation? What they are doing is subversive and the security can not close their eyes; we have to guard our nation. Gone are the days when this kind of things happens,” Evbakavbokun said. Items recovered from the arrested members, as listed by the CP, included Biafra uniforms, Biafra ID cards, Biafra flags and some buses.